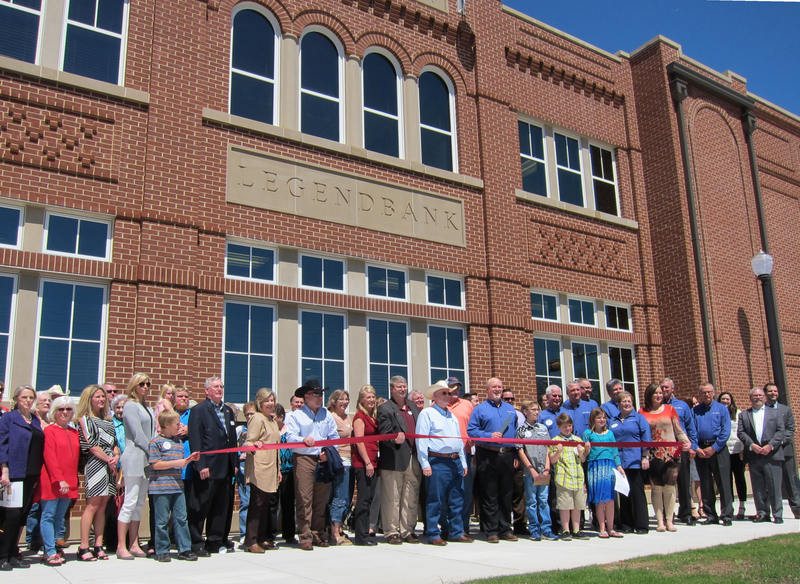 May 2016 – Legend Bank, a community bank founded in Bowie, Texas in 1890, is pleased to announce the opening of their new headquarters building at 101 W. Tarrant. 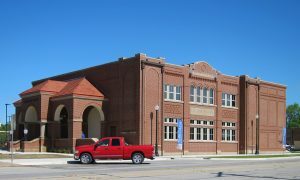 The new building was designed to maintain the Bank’s history in this community and support the revitalization of downtown with the help of Rogers-Ford Architecture and Interior Design. The building was designed as a tribute to the city of Bowie and the historical features provide an experience of banking over 100 years ago. The main entrance of the bank features a history hall highlighting key historical artifacts and community-specific photographs. The interior has mosaic tile flooring at the entry, reminiscent of old building entries, as well as wood flooring throughout in the main areas. The ceilings are adorned in stamped metal tiles with decorative lighting. The artwork selected for the interior reinforces the Bank’s pride in the community. Three original features are on display from the Bank’s founding. The cannonball safe was used in First National Bank of Bowie in 1890. It weighs approximately 3,700 pounds and served as the Bank’s primary safe at that time. Two original vault doors are on display in the main lobby on either side of the Bank’s vault. The doors are hand painted to represent their original design from the 1900’s. One door is the original vault door from First National Bank of Bowie and the second is from The City National Bank of Bowie, which was acquired in 1930. The new lobby features a state-of-the-art customer service area with free floating stations to provide convenient service for all of the customer’s needs. “The customer service area has primary placement in the center of the branch because we believe service to our customers is a privilege and our core mission is to provide legendary service to them,” said Legend Bank regional president and executive vice president Bret Meekins. The antique teller station is reminiscent of the early 20th century, designed to take customers back to banking in those days while providing quick processing of transactions. The second floor of the new headquarters building features executive offices, the board room and Investment Professionals, Inc. offices to provide customers with long-term financial planning and investment services. The Bank’s Ribbon Cutting event was held on Thursday, April 21, 2016. Next Post Legend Bank’s Bowie Headquarters Wins Award!